Shotokai was originally conceived by Master Gichin Funakoshi, who is considered to be the founding father of modern Karate-do. One of Master Funakoshi’s students, a gentleman by the name of Shigeru Egami, further developed the art of Shotokai. Egami Sensei believed that there was a oneness between spirit and technique. Every technique contained spirit or feeling. The near perfection of technique would always follow a strong spirit. Today the benefits people receive from the practice of the martial arts have been well documented. Fitness, coordination, concentration, higher self-esteem, higher self-discipline and a higher awareness to name but a few of the benefits of Karate-do Shotokai. 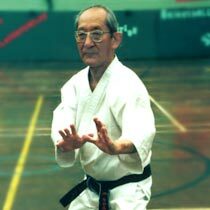 Our senior instructor, Sensei (master) Mitsusuke Harada, was born in Manchuria in 1928. He started his karate training with Master Funakoshi’s group in Tokyo. Master Harada entered Waseda University in 1948, and immediately joined the University karate club which was at the time very strong. During this period, Harada Sensei continued to receive instruction from Master Funakoshi, who, by this time, was very old. In 1951 Harada Sensei gained the Bachelors’ Degree in Economics and Commerce, and then proceeded to further his education by studying for another two years. In 1953, he was awarded a Master’s Degree. After leaving University, he started work in a Tokyo bank, and in 1956 was sent to Sao Paulo, Brazil by his company. Master Harada founded his own group in Brazil, and at this time, at the age of 28, he received his 5th Dan black belt directly from Funakoshi. 5th Dan remains the highest level of black belt in the Shotokai organization. In 1963, Harada sensei was invited to Paris to teach karate. It was during this period that Harada Sensei decided to devote his life to karate. He resigned from the bank, and was invited by Kenshiro Abbe of the British Judo council to come to London to teach karate. In 1963, Harada Sensei gave a demonstration of karate at the Albert Hall, and became the first resident Japanese instructor in Britain. In the mid 1960’s Harada formed the Karate-do Shotokai (KDS). Master Harada’s role is that of overall Sensei (instructor) of the Association, and advisor to the technical Executive, on matters pertaining to the practice of Karate-Do. In the early 1970s Milton Veinot went to England to study law. While there he began practicing Karate-do Shotokai with the Southhampton club, which was probably the largest and most well known club in England. After receiving his shodan (black belt) Milton returned to Canada and began teaching at the YMCA in Halifax, being one of the first karate teachers in Halifax at the time. Unfortunately, due to the demands of his law practice and problems with his knees, after a few years he was forced to stop teaching. One of Milton’s most promising students, Amin Nasr, restarted the club after Milton left, traveling to England periodically to train under Harada Sensei. In addition to his karate practice, Amin also brought with him a background in other Eastern arts, such as yoga. It was through Amin’s dedication and efforts that Shotokai developed in Nova Scotia. One of Amin’s first students was Bob Bennett, who started in 1979. Clarence Whynot, our senior instructor now, started in 1980. Amin left the club in 1986, or thereabouts, moving to Richmond Hill, near Toronto. He presently operates the “Center for the Ways” there, teaching a variety of Eastern martial and healing arts including: karate-do, chi kung, yoga, reiki, shiatsu, acupuncture and tai chi. He periodically travels to Nova Scotia to give seminars on karate-do and other related arts. Bob Bennett took over the Halifax YMCA club after Amin left, assisted by Clarence Whynot. Within a relatively short period of time, however, Bob moved to New Glasgow, Nova Scotia, and now teaches Shotokai karate at the New Glasgow YMCA, offering youth and adult classes, while Clarence took over the Halifax club. Clarence Whynot taught at the Halifax YMCA for a number of years, later being assisted by Randy Veinotte, who started practicing in 1989. In 1992 Clarence was asked to start another club at the Dartmouth YMCA, and in 1993 Randy also started a new club at Mount Saint Vincent University (MSVU). In 1997 it was decided that the Halifax YMCA club would be closed down due to the difficulties involved with two teachers trying to operate three clubs. Clarence continued to run the Dartmouth YMCA club and Randy kept operating the MSVU where he still teaches. In September of 2004 the Dartmouth club relocated to Brookhouse School after main years of being associated with the YMCA. The club continues to run youth and adult programs out of Brookhouse. Lawrence Dagenais opened a club in Sackville, Nova Scotia in 2005 but still trains with the Dartmouth club when he can. Unfortunately his club is now closed. Frank Zinck opened a club during the Winter of 2007 at the North Woodside Community Centre in Dartmouth and still trains with the Brookhouse dojo as well.